Are you on the journey to moving to a new home? If you are, then you know that one of the most demanding tasks you’d have to experience is the task of moving your huge furniture and appliances. The bed set and mattress, for example, need a lot of effort and work. So, if you want to move your king size, queen size or twin size mattress, use the following guide on how to protect a mattress when moving. The first step is to measure your mattress and determine how it’s going to fit through the stairways and doorways. You need to ensure your moving vehicle can also accommodate your bed set. You need to plan on how you can base move the mattress into the vehicle. It is recommended to map out the course of the bed set as early as possible. Whenever moving, you need to begin with the small items first. That way, you can acquire the small items of appliances and furniture out of the way. Doing it will also make room for the bulkier ones. Inside your room, you also need to remove the drawers and cabinets to make some space for your mattress and bed. Do not forget to call for additional reinforcement. You can ask some of your friends or your loyal neighbors to assist you to move your mattress to the moving vehicle. Mattresses, particularly king-sized and queen-sized ones are quite big and heavy. So, if you’ve got a high-density foam bed such as latex foam or memory foam, it might need the assistance of a few individuals. Further, high-density beds are heftier than standard mattresses. You need to organize the proper position of the individuals carrying your mattress. Make sure that you provide them with a short meeting on how to protect a mattress when moving and transfer it safely into the moving van. You also need to inform them on how to flip or how to turn the mattress over in case you experience any roadblocks. Determine the ideal way of lifting your mattress. Did you know that it’s a bad idea to lift the mattress with your hips or your back? Doing that will lead to hurting your back if your lift the bed and move all the heaviness to your back. Instead, you need to bend your knees and use it to lift the mattress. Before moving your mattress, ensure that you check for any damages first. Doing it will enable you to determine if it has been scratched before or after the move. Apart from that, make sure to clean your mattress. 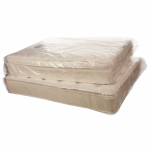 You might wish to buy plastic mattress bags to avoid it from being infested by dust mites or bed bugs while in transit. Finally, place your mattress in the moving van carefully. You need to guarantee that there are no dirt particles on the ground. Make sure that the windows are closed as well to avoid the dirt and dust from flying inside. With this guide on how to protect a mattress when moving, for sure you are now ready to move your mattress any time of the day!